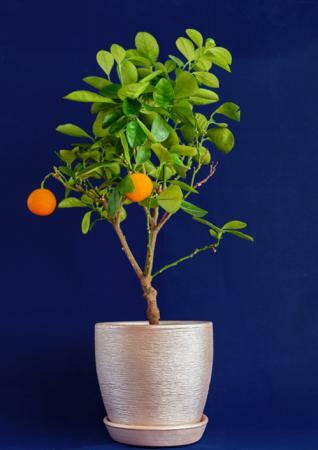 Miniature fruit trees are perfect for the gardener with limited space. You can grow them on a patio in containers or planted in the ground. They don't take a lot of space yet they can produce the same size and quality of fruit as their standard-sized cousins. Gardeners are no longer restricted to just miniature trees that grow apples and lemons. There are miniature varieties of oranges, peaches, and even bananas! Bonanza Miniature Peach: Mature trees reach between five and six feet in height. Harvest from mid-June to early August. This is a freestone peach, meaning the pits fall away easily. It is self-pollinating, and the blossoms are a beautiful pink. Recommended for zones 6 through 10. 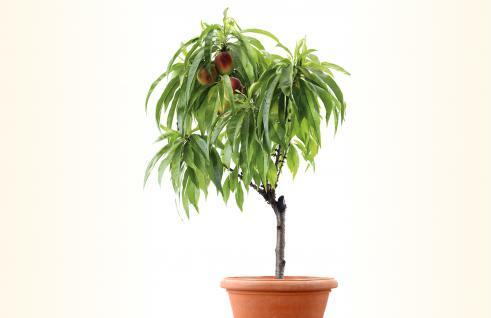 Leprechaun Dwarf Nectarine: This nectarine tree reaches a height of five feet. Grows well in an 18- to 24- inch sized container. The fruit size is medium to large. The red over yellow fruit ripens in July. Recommended for zones 5 through 8. The Family features two apple varieties. The Companion needs another variety to pollinate. Colonnade® Polka Apple: A columnar apple tree that reaches 8 to 10 feet tall with a limb spread of two feet. Suitable for zones 4 through 8. 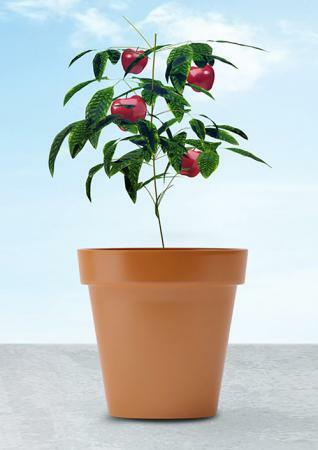 Urban Apple®: This miniature apple tree grows from 8 to 10 feet high. The average mature limb spread is two to three feet. Some varieties include Blushing Delight™, Tangy Green™, and Golden Treat™, all of which originated in the Czech Republic (2011). These are available in the United States. Columnar: The columnar apple tree has a mature height from four to 12 feet high with a mature limb spread of two to three feet. Bears fruit from 0 to 1 year. Ultra Dwarf Patio Apple Trees: This apple tree can be planted in containers no bigger than 18" x 18". They can provide as much as 30+ apples per harvest. 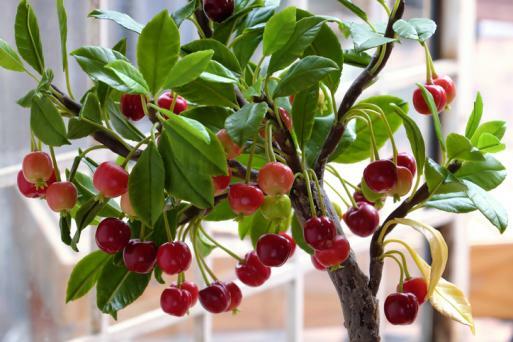 Miniature cherry trees are in high demand for their sweet flavors. They can be eaten right off the following miniature trees. Compact Stella: This variety does best in areas with mild winters. The tree produces a large, sweet cherry. It can grow four to six feet tall with a limb spread of up to four feet. Miller EXtra Dwarfed Bing Cherry: This tree produces the same cherries loved by many. It can grow up to six feet tall with a limb spread up to six feet wide. Grows best in zones 6 through 9. Citrus trees love the sun, be sure to place in direct sunlight inside and when setting on the patio during warmer months. 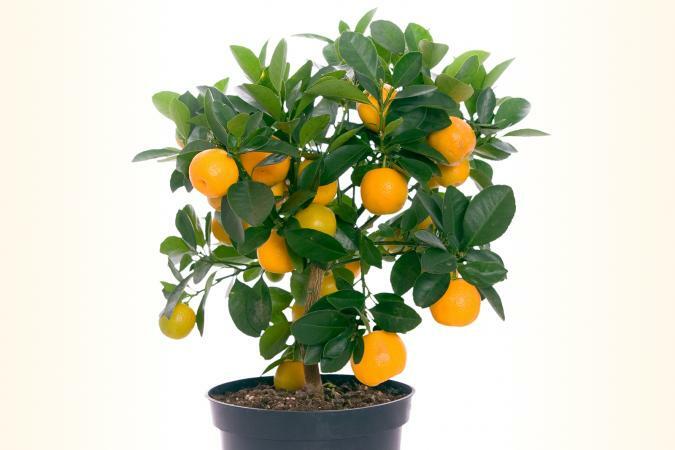 Meyer Patio Citrus Trees: Meyer citrus trees are available in miniature lemon, grapefruit, orange, and lime trees. Mature trees grow to 5 to 10 feet high (depending on the size of pot) with 24" to 48" limb spread width. Self-pollinating, the fruits are sweeter than most. Dwarf Dancy Tangerine: Grow delicious tangerines on this tree that only reaches a height of three to four feet tall. Dwarf Valencia Orange: This two to three-foot tree will produce full-sized sweet, Valencia oranges. 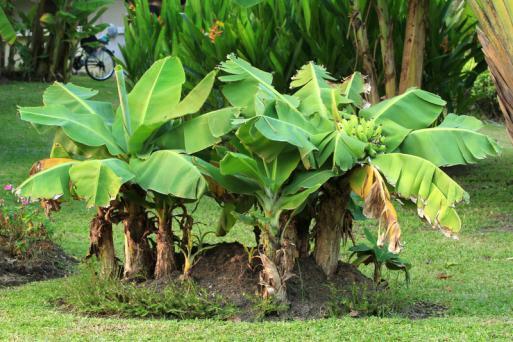 You can grow banana trees on your patio, too. Mature height is between five and eight feet with a limb spread width of 36 to 48 inches. Leaves grow to 12 inches long. Harvest bananas in the summer. Mature trees require 10 to 12-inch diameter pots. Needs sunlight in winter. Miniature trees are easy to care for, requiring little attention other than regular watering and fertilizing during the blooming cycle. In zones 4 through 6, plant miniature fruit trees in containers. 1-year-old trees: Plant in a 12-inch diameter container. 2-3-year-old trees: Plant in a 14-in diameter container. Older trees: Plant in a 16- to 20-inch diameter container. Be sure to bring the containers indoors or place them in an unheated space, such as a garage, to protect them during the winter months. Miniature trees may require some pruning in late winter. Follow overwintering requirements for specific trees. Cold zones no longer prevent you from growing fruit trees. With miniature trees, you can even grow a mini-orchard in patio containers and enjoy a variety of fresh fruits.